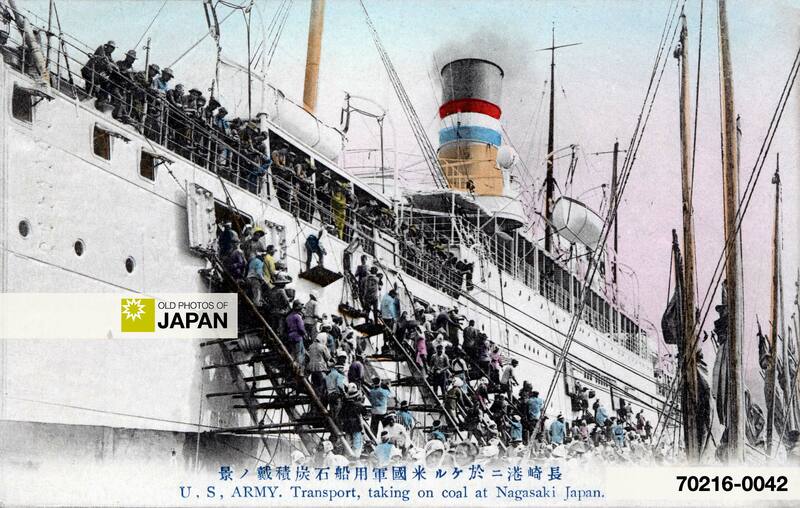 A crowd of harbor workers load high quality Kyushu coal onto a US army transport ship in Nagasaki. As soon as ships entered Nagasaki Harbor, hundreds of men, women, girls and boys swarmed around them on coal barges, built temporary structures, and started to load the hungry ships with coal. The spectacle was popular entertainment for the passengers. For hours and hours on end the coal loaders would work like an efficient piece of machinery often dressed in very simple clothing. In summer, many wore nothing more than loin cloths and head bands as protection from the burning Kyushu sun. Coaling a ship at Nagasaki is an interesting process. Before a ship has settled to her anchor, the large coal barges bear down upon her. In an incredibly short time a scaffolding of poles is tied in place from the ship’s side to the water’s edge, and upon each round of the improvised ladder a young girl takes her place, making a line of girls from the barge to the dock, up which living ladder the coal passes to the ship’s bunkers. Men in the barges shovel it up in shallow baskets holding a little less than half a bushel. This basket passes from hand to hand until it reaches the ladder, when the first girl seizes it and swings it straight up in front of her above her head, where it is caught by the girl above her; and so it goes on, from girl to girl, never stopping for a single minute until it finds its place in the bunkers of the ship. A line of small boys passes the empty baskets back to the barge to be refilled. Thus hour after hour the work goes on. You take out your watch to time them, and find the rate kept up with the regularity of machinery. Eighteen to the minute, twenty to the minute; laughing, talking the while, still the work goes on. Barge after barge is emptied and replaced by a full one, and yet the living elevator carries up the never-ending line of baskets until the last bunker is full, and then the ladders come down even quicker than they went up and the vessel is once more ready for her voyage to Hongkong or San Francisco and back. 1 Schwartz, Henry B. (1908). In Togo’s Country, Some Studies in Satsuma and Other Little Know Parts of Japan. Jennings and Graham, 200-201. You can also licence this image online: 70216-0042 @ MeijiShowa.com.